To understand why comparing and switching is so problematic, we challenged 88 people to find the cheapest energy deal using the 5 leading price comparison sites—GoCompare.com, uSwitch.com, Confused.com, CompareTheMarket.com and MoneySuperMarket.com. The research platform we used was whatusersdo.com. Participants were from all over the UK. Their age range was 20—76. They chose the time and place to undertake the challenge. They were given as much time as they required to complete it. To ensure the results were fair and accurate, the participants were all provided with the same bill to work from. The results highlighted the massive problems associated with comparing and switching energy deals. 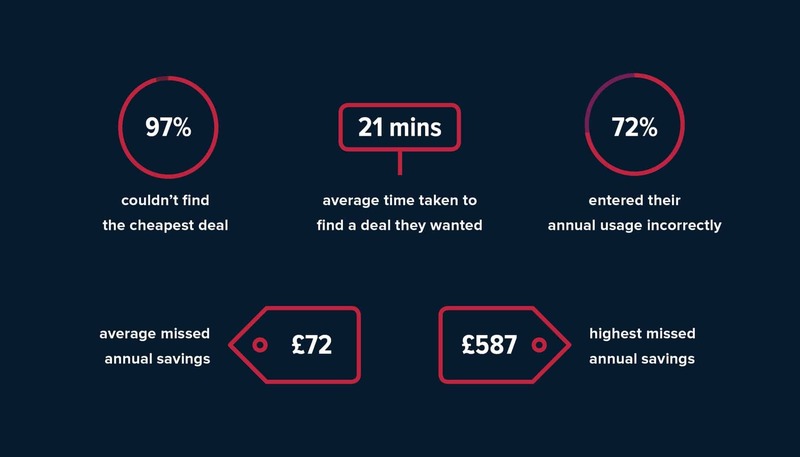 On average, it took the participants 21 minutes and 54 seconds to find what they thought was the cheapest deal. A staggering 96.59% didn’t actually find the cheapest deal. A massive 71.6% entered their annual energy usage incorrectly, adding further validation to research conducted by YouGov that found that 60% of people find energy bills difficult to understand. In addition, the highest missed annual saving was a whopping £587, while the average missed annual saving was £71.54. We asked the participants tell us about their experience using price comparison sites for the challenge. Why Flipper is a better alternative for you than price comparison sites. Unlike price comparison sites, Flipper doesn’t ask you for information from your energy bill that people tend to misinterpret or get wrong, and we don’t give you a long list of energy tariffs to wade through and compare yourself. We simply check your energy usage to find you your best deal, and better yet, we’ll then manage the switch on your behalf, saving you both time and money. After the participants completed the challenge, we asked them to take a look at Flipper’s website and compare our service with the price comparison sites they’d just used. Goodbye price comparison. Hello Flipper. For seamless switching to your personal best energy deals, join Flipper. Many of our customers knew they could save money by switching but couldn’t be bothered with the hassle. On average, we’ve saved them £385 without them having to lift a finger. Let us do the same for you.